Start your day off on a delicious note with prosciutto and eggs. 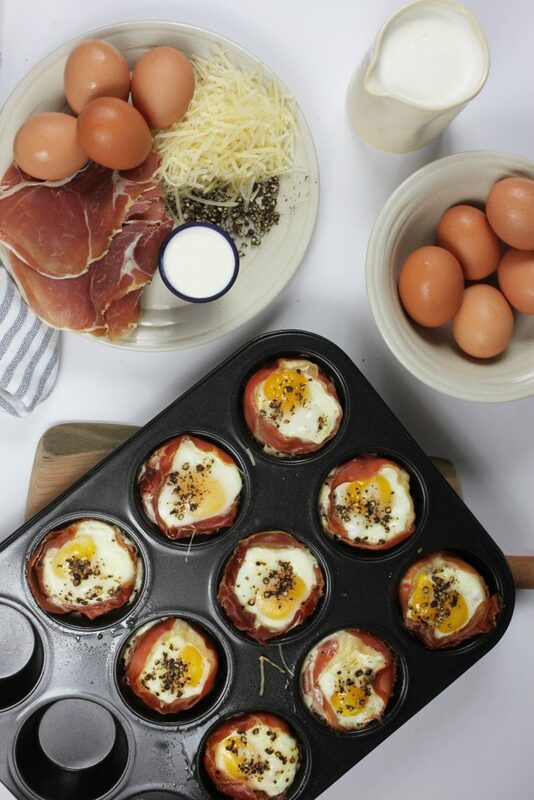 Perfect for making ahead of time, these cups with prosciutto and eggs can be assembled easily and cook quickly so you can enjoy them during a leisurely brunch or before the start of a hectic day. Enjoy with a mimosa among friends or a strong cup of coffee solo – this dish is equally delicious whatever the occasion. Take a quick look for the fun how-to video from Lucie Fink. Lightly grease a 9-serving cupcake pan and place 1-2 slices of Prosciutto di Parma in each ‘cup’ to make sure the bottom is covered. Fill the Prosciutto di Parma cup with grated cheese. Crack one egg in each cup on top of cheese. Add freshly cracked black pepper, to taste and bake until eggs are cooked and prosciutto becomes slightly crisp on edges.